Welcome to the Capo Valley 4 Wheelers! 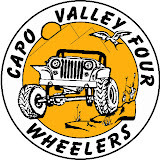 Family oriented, environmentally sensitive, Capo Valley Four Wheelers is made up of highly experienced as well as "rookie" off roaders. Our member ages run from the late teens to "seasoned citizens". Our mission is to promote camaraderie, share experience, and promote our sport. We are sponsors of the Adopt-A-Trail program and have our own trail in the San Bernardino National Forrest. We are also member of the California Association of Four Wheel Drive Clubs, Blue Ribbon Coalition, and Tread Lightly. Our trips vary from moderate to difficult. We welcome new members of all experience levels. Then fill out the New Club Member form. 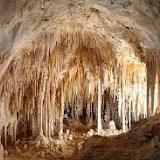 The Mitchell Caverns event is coming up in a day! The SBNF Adopt A Trail Quarterly Meeting event is coming up in a day! A new video, Rattlesnake Canyon, Capo Valley 4 Wheelers March 2019, has been added. The Rattlesnake Canyon event is coming up in a day! The Tip Top Mountain work day event has been created. The Left Coast Brewery Meetup event is coming up in a day!